I’ve been given the task of writing some perl scripts which will run on a Solaris 10 machine and communicate with an Oracle 10g XE database which in turn is living on a RHEL5 box. While I have some experience installing/patching Oracle, I’ve never written a script which communicates directly with it – so this should be a good learning exercise. There’s a simple table in the database called “SM_USER_CONFIG” which contains a few rows just for testing. The first step I feel, is to get the machine communicating with the database via sqlplus. Next up is perl. We will build DBD::Oracle for this. Head over to cpan and download the src. We’re using CSWperl from blastwave. Remember to actually *READ* the README file! Especially if you have any problems. WARNING: Setting ORACLE_HOME env var to /opt/instantclient/ for you. WARNING: If these tests fail you may have to set ORACLE_HOME yourself! then it’s likely that you’ve not configured your environment correctly. set to include the directory containing the Oracle libraries. Found header files in /opt/instantclient//sdk/include. read all the log printed above, and the README and README.help.txt files. Notice the warning about sqlplus failing above. As we’re building this on a CLIENT, when sqlplus is invoked it doesn’t specify @XE.WORLD (default is to connect to a local database)- We can just ignore this. Extracted ora_explain from ora_explain.PL with variable substitutions. 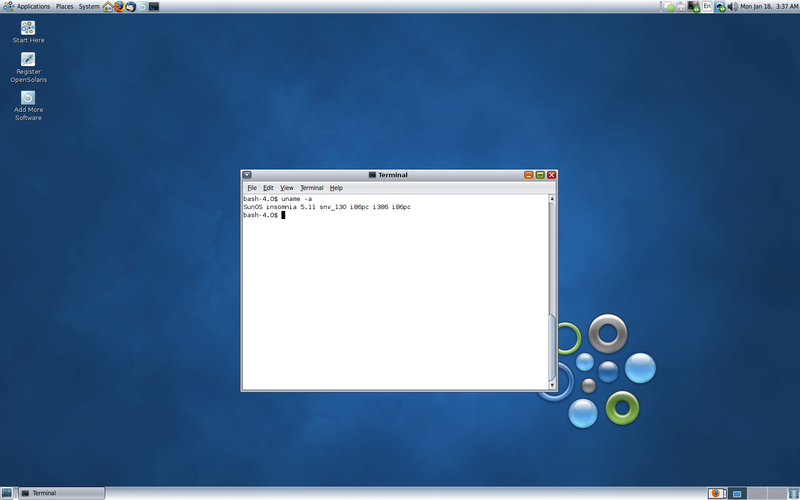 OpenSolaris 2009.06 was released a few days ago! As it’s been a while since I’ve used this distro and I feel like creating my inaugural blog post; lets give it a spin. The point of this exercise will be to have OpenSolaris 2009.06 and SXCE (nevada) b115 installed to the same zpool. Everything went smooth, and thus far IPS hasn’t died once yet either. A definite improvement over the previous releases. This takes a good old while, best to find something other to do while it runs. This process takes a while, so you’ll need to find yet another way to keep yourself amused while it runs. Cool. Can we mount it? (insomnia:/mnt/etc) houst0n > pfexec cp /etc/path_to_inst /etc/zfs/zpool.cache /etc/driver_* . A reboot later, and we’re booted successfully into snv111. Current boot environment is named <snv_111>. Creating initial configuration for primary boot environment <snv_111>. The device </dev/dsk/c3d0s0> is not a root device for any boot environment; cannot get BE ID. PBE configuration successful: PBE name <snv_111> PBE Boot Device </dev/dsk/c3d0s0>. Creating configuration for boot environment <snv_115>. Source boot environment is <snv_111>. Cloning file systems from boot environment <snv_111> to create boot environment <snv_115>. Creating snapshot for <rpool/ROOT/snv_111> on <rpool/ROOT/snv_111@snv_115>. Creating clone for <rpool/ROOT/snv_111@snv_115> on <rpool/ROOT/snv_115>. Setting canmount=noauto for </> in zone <global> on <rpool/ROOT/snv_115>. Saving existing file </boot/grub/menu.lst> in top level dataset for BE <snv_115> as <mount-point>//boot/grub/menu.lst.prev. Population of boot environment <snv_115> successful. Creation of boot environment <snv_115> successful. Creating upgrade profile for BE <snv_115>. Checking for GRUB menu on ABE <snv_115>. Saving GRUB menu on ABE <snv_115>. Determining packages to install or upgrade for BE <snv_115>. Performing the operating system upgrade of the BE <snv_115>. Restoring GRUB menu on ABE <snv_115>. Adding operating system patches to the BE <snv_115>. PBE GRUB has no capability information. PBE GRUB has no versioning information. ABE GRUB is newer than PBE GRUB. Updating GRUB. environment <snv_115> contains a log of the upgrade operation. environment <snv_115> contains a log of cleanup operations required. WARNING: <1> packages failed to install properly on boot environment <snv_115>. The Solaris upgrade of the boot environment <snv_115> is partially complete. Saving existing file </etc/bootsign> in top level dataset for BE <snv_111> as <mount-point>//etc/bootsign.prev. Saving existing file </etc/bootsign> in top level dataset for BE <snv_115> as <mount-point>//etc/bootsign.prev. Copied boot menu from top level dataset. Generating xVM menu entries for PBE. No more bootadm entries. Deletion of bootadm entries is complete. 5. Exit Single User mode and reboot the machine. Propagating findroot GRUB for menu conversion. Deleting stale GRUB loader from all BEs. Activation of boot environment <snv_115> successful.